Day 15: Friendly suggestion: don’t go to the Food & Drink section on Pinterest. No good will come of this. It will be all desserts and breadsticks and cheese and you will feel a strange mix of nostalgia and sadness. Your broccoli is waiting for you. Day 16: Sigh. I don’t really like the meals that I made for the next few days… but I don’t want to waste food. If I were going to give in and just go drive through Taco Cabana instead, this would would be the time. But I won’t! I have some delicious sounding recipes coming up though, so hopefully those will be delicious! Day 18: I just watched the documentary Fed Up and I never want to eat sugar again. I know I’m going to, but man. I’m also glad now that I mostly brought my lunch while going to school. Yeesh. Day 20: Allergy update- they have gotten better! I can’t tell if it is just because of all the rain or if they are actually starting to go away, but I’m a fan! 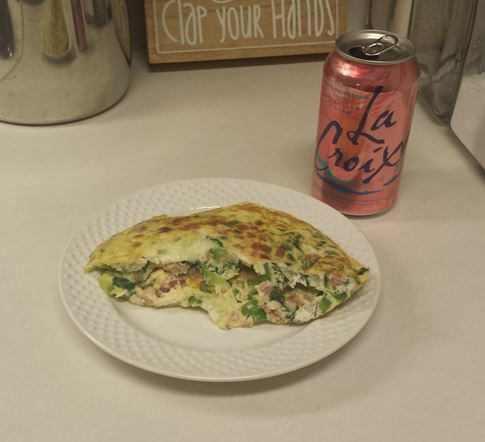 Favorite meal of the week: a delicious omelet with chopped green peppers, spinach, ham, and bacon! And don’t forget the La Croix! I got the Cran-Raspberry flavor and it is so good. These just might be my new addiction. Things were definitely getting easier in week 3, but be sure to check back tomorrow to see how the last week (plus a few days) went! Hi Katie! (Or not Katie) I started Whole 30 yesterday (woohoo!). I’m going to Fuzzy’s tomorrow as well, so thanks for the tip on the shredded beef salad. 🙂 Do you know if any of the other salads at Fuzzy’s are ok to eat, or just that one? I can’t find info anywhere. Thanks in advance!